BluRay: The Blu-ray Edition is a Complete copy of the current Library on multiple Blu-ray Verbatim Datalife BDRs in Directories/Folders in the same organization as the Main Library Index. Currently the set is 9 discs though that will grow as the library size grows. Free Shipping in the U.S.
BluRay: The Blu-ray Edition is a Complete copy of the current Library on multiple Blu-ray Verbatim Datalife BDRs in Directories/Folders in the same organization as the Main Library Index. Currently the set is 9 discs though that will grow as the library size grows. The Blu-ray discs are Verbatim DataLife BRS which I have been using for many years and on which I store all of my own archival files. The Blu-ray discs are in paper sleeves and labelled with sequence and the Category ranges each contains. Some categories may span discs to make more efficient use of space. I rebuild the Disc Images periodically as we add new categories to make the most efficient use of the discs. 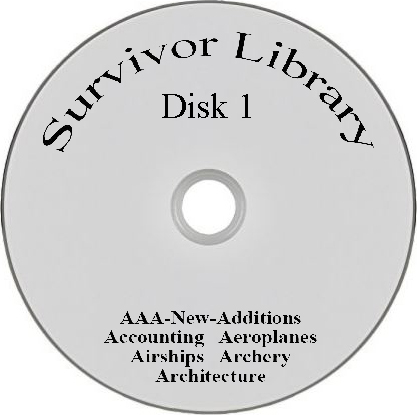 The last Disc will often include one or more new Categories which have been added since the last Disc Image rebuild. Shipping in the U.S. is free via First Class Mail. If you live outside the U.S. please contact me about shipping costs which generally add $5 -$10 to the price depending on where you live.